Essential oils are the volatile liquids and aromatic compounds distilled from flowers, trees, roots, bushes, shrubs and seeds. An essential oil contains the true essence of the plant it was derived from and is highly concentrated. These oils have regenerating, oxygenating and immune supporting properties which can assist our animals in the healing process. Essential oils provide energetic balance and help in healing through the sense of smell. As the olfactory system is stimulated, physiologic functions are supported which allows the body to self-heal. They also have antiseptic, antimicrobial and detoxifying properties and can help with emotional issues such as anxiety and stress. In addition to direct inhalation another excellent way to get these benefits is by diffusing the oils in a cold air diffuser. Essential oils may also be used topically or ingested. As a rule, when working with animals, LESS is MORE, as sense of smell is highly developed in many animals due to their instinctual nature. For example, a human has 5-6 million olfactory receptors while the dog as 220 million. Whether working with humans or animals be sure that the essential oils used are therapeutic grade. Therapeutic grade oils are pure. They are grown, harvested and packaged with minimal harm to the plant. These plants are wild crafted, meaning the soil has never been exposed to chemicals and wind patterns are studied to see that nothing harmful can blow onto the soil. The plants are distilled with a low heat, low steam and low-pressure process to maintain the integrity and therapeutic benefits of the plant. Caution should be exercised with cats when using essential oils with a high phenol content. Cats do not have some of the liver enzymes needed to help metabolize the phenol constituents of certain oils. Melaleuca oil (Tea Tree) should never be used on birds. Melaleuca can cause an adverse reaction in birds which may result in death. In maintaining the health and well-being of our animal companions just remember the LESS is MORE rule. When in doubt consult your veterinarian or a holistic animal practitioner who is experienced with the use of essential oils. (2013). Healing touch for animals level 3 workbook (6th ed.). Highlands Ranch, CO: Komitor Healing Method, Inc. Essential oils for animals. CreateSpace Independent Publishing Platform. DBA On-Demand Publishing, LLC. Special fifth edition. Orem, UT: Life Science Publishing. 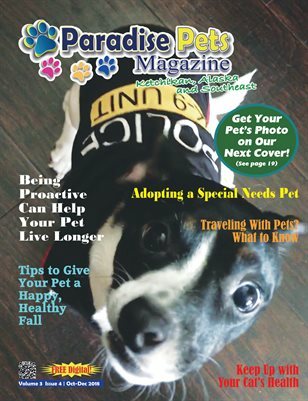 This article was originally published in Paradise Pets Magazine, Key West, FL Apr-June 2015 Vol. 1 Issue 2. 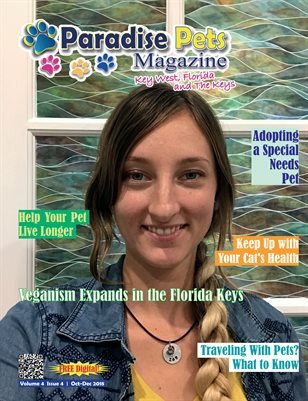 You can read the entire issue by clicking the cover image. They are also available at MagCloud and Magzter.